What do you think of when you hear the word “Scotland”? Hills, lakes, heather and castles? This is a cracking little commercial pretending to be a “behind the scenes” look at the marketing department of Mike’s Hard Lemonade. Anyone who was around in the 80′s will remember these little nasty critters. I for one, geeky as I am, am glad to see them make a reappearance, even in an advert for a product as dull as this one! Watch this advert very very carefully. It’s an awareness test and takes some serious concentration. Not everyone can keep up, it’s actually a very difficult challenge. How does a brand communicate that they have fixed something bad, controversial or unpleasant? For a long time the Blue Smarty was considered bad. The theory went that this was a color not found in nature, therefore it was not only going to be artificial, but potentially toxic. Mums heard about kids going crazy on the additives and didn’t want their own little bundles of energy going the same way. Mastercard scored a real winner with this ad. I never knew the Simpsons had done any TV advertising! Really I guess the Simpsons should be an obvious target to take part in advertising for something as general appeal as credit cards. The fictional family is more “everyman” and more familiar than pretty much any other celebrity endorsement, and closer to real families than most would like to admit! Not only is the ad funny, it also makes a strong play on the famous Mastercard hook that has entered popular culture. 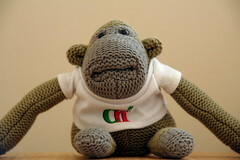 Jonny Vegas (Al) and Monkey are a TV advertising double act that were recently revived. As anyone who has seen my Twitter background knows, I love the Monkey character. I wonder if Jonny Vegas has a love-hate relationship with the character. On the one hand it has made him more well known, on the other the character, and more so the monkey, are much more famous than his own standup shtick. Peter Kay, a much loved British comedian, has produced some of the funniest Television adverts on UK Television. Such a shame outside his home country he is largely unknown.